Birthplace: Kyoto, Japan (also where she grew up). Does anyone one if she has new manga in progress? She.Is.AMAZING! <3 and I agree with Kristen-chan :D I got Saruyama v.1 as a gift and I ADORE it <3 SOO buying the rest. I lovelovelove her work/mangas! 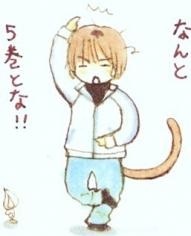 I've read Monkey High!, Koi no Uta and 18 diary so far. Really enjoyed reading Monkey high. :D definitely looking forward to read more mangas from her. she has a lot more work than this.. can't imagine that i would update this list though..
Monkey High is one of my favorite manga's though I've only read one volume! I'm planning on buying them all.